- Beginning October 10th, children in kindergarten through 4th grade are invited to our after school youth program. We will have pickup from elementary schools (if we know your child is attending the program) or parents are welcome to drop their students off. We will offer snacks, have activities, learn about God's love, and more every Wednesday until 5:00pm in the Christian Life Center! Please register and fill out a medical release form by October 3rd by clicking on the links below. Drop off your forms to Traci in the main office. Please note: Wednesday programs will not meet on Wednesday, October 31 due to Halloween, nor will they meet on Wednesday, November 21 due to the Thanksgiving Eve service and no school. We will still have our all-ages dinner on November 21 from 5:00-6:15pm. 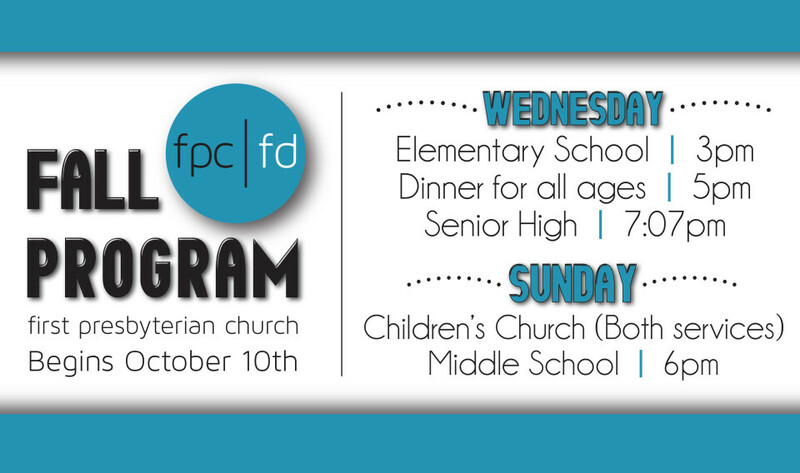 Beginning Wednesday, October 10th from 5:00-6:15pm there will be an all-ages dinner in the Christian Life Center. This will be offered every Wednesday as a chance for a meaningful interaction for peoples from all ages and stages of life. Come and go as needed. Some weeks there will also be opportunities for activities after you finish the meal that support different organizations around the community. Find information about our high school programming that will begin on October 10th by clicking on youth and young adults under the ministries tab at the top of the page.